The AFL today welcomed the launch of a new look North East Australian Football League (NEAFL) following a series of changes that will ensure the League’s continued development as the leading second-tier Australian Football competition in New South Wales, Queensland, the Northern Territory and the ACT. A range of structural and organisational changes have been implemented as part of the NEAFL’s long-term focus on increased competition standard and enhanced talent pathways. As a result of these changes the NEAFL competition will comprise 14 clubs, reduced from the current total of 19 clubs. These changes will come into effect from the 2014 season. The competition will include four clubs from the ACT: Ainslie, Belconnen, Eastlake, Queanbeyan; two from NSW: Hills Eagles, Sydney University; three from South East Queensland: Aspley, Redland, Southport; one from the Northern Territory: NT Thunder; four AFL Reserves teams: Sydney Swans, GWS GIANTS, Brisbane Lions and the Gold Coast SUNS. A license application for a North Queensland team is currently under review with the outcome to be announced shortly. Following a consultative process between all current NEAFL clubs and the two state bodies of AFL NSW/ACT and AFLQ, it has been agreed the following clubs will not have their NEAFL licenses renewed at the conclusion of the 2013 season: Tuggeranong (ACT), Broadbeach (QLD), Labrador (QLD) Morningside (QLD) and Mt Gravatt (QLD).Tuggeranong will compete in the AFL Canberra Division 1 League in 2014, while the four Queensland clubs will gain automatic entry into the new Queensland Australian Football League (QAFL) state league competition to be announced in the coming weeks. The current two conference system comprising the Northern (QLD/NT teams) and Eastern (NSW/ACT teams) conferences will be abolished with all 14 teams operating under a singular competition, as follows. In addition to a new-look competition, a series of operational measures will be established for the 2014 season, including improved compliance and financial benchmarking, as well as a commitment to bolstering talent pathways and enhancing state leagues. AFL National Second Tier Manager, Simon Laughton, said the structural changes were an essential step in the development of the NEAFL following its inception two years ago. “As part of the NEAFL’s next phase of growth we are looking to further evolve the competition to meet new standards of professionalism both on and off the field,” Mr Laughton said. “This is a natural progression for a competition that has established itself as the premier development league for the eastern and northern regions of Australia. “These changes will result in a better standard of competition while securing vitally important talent pathways. They will also ensure clubs in both metropolitan and regional communities continue to be professional, well run, financially viable organisations that maintain strong ties to the community and enable young athletes to reach their potential. “These changes have been reached following extensive consultation with all current NEAFL Clubs, and with the League’s long-term growth at the forefront of discussions. Those clubs that won’t be participating in next year’s NEAFL will receive ongoing support while continuing to provide opportunities and vital links to local communities. 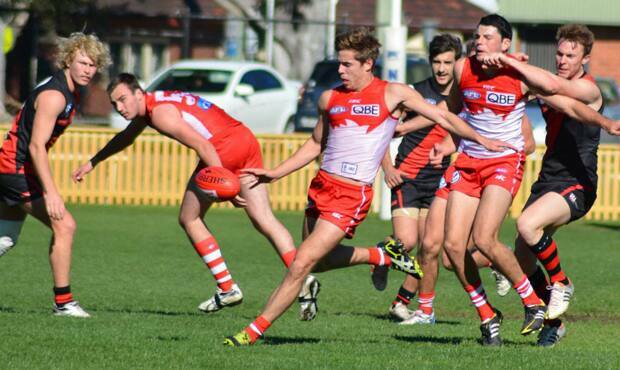 The NEAFL is the premier development league in Australia’s northern and eastern regions, providing player talent to the relevant state leagues along with the associated AFL clubs. The NEAFL was introduced in 2011 and is currently made up of clubs from Sydney, Brisbane, the Gold Coast, Canberra and the Northern Territory. It provides an elite second-tier competition for reserves sides from AFL clubs in New South Wales and Queensland, the Sydney Swans, the Greater Western Sydney GIANTS, the Brisbane Lions and the Gold Coast SUNS.